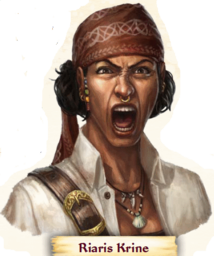 This Sunday in Skull & Shackles, the PCs explored the castaway’s lodge, picked up some supplies for Man’s Promise, and received a concerning message from their spy still aboard. When we left off last week, Valana had just opened the door to the lodge and barely had time to take in the hanging corpse and awful stench before she was swarmed by flies flooding out of the stinking place. Valana fell backward as the flies swarmed around her, biting fiercely. She turned and ran for the stockade gate with the flies still surrounding her. Killian, still examining the spyglass, thinks quickly and retrieves a torch and lights it. As Valana moves past Shiera the bugs go after her as well and they both continue toward the gate. Keeya creates some dancing lights in a vain attempt to draw the swarm off, but they appear to prefer the fresher meat offered by the two fleeing ladies. Afari realized there not much he can do so he too exits by the gate, followed by Keeya. By now, even sturdy Valana has been badly bitten and she falls to the ground. More delicate, Shiera has also met her match and collapses near her friend. Still the flies swarm around the fallen crewmates. Realizing their danger, the group rallies: Keeya and Rosie both stop their rout and produce and light torches, charging into the swarm with Killian coming at the bugs from the other direction. Afari manifests a glowing humanoid form (MA: dancing lights again) and uses it to lead the swarm away from his comrades. This time it works, thanks to the burning flames wielded by Keeya, Killian, and Rosie! Keeya lifts Shiera’s head and helps her drink the contents of the vials given to her by Harrigan after the taking of Promise. The healing effects of these potions bring her back to consciousness, thrashing and still trying to run to escape the cloud of biting insects. After she comes to her senses Shiera turns to Valana to help her, with a little assistance from blessed Besmara. Until now, Afari has been keeping a keen eye on his apparition and the swarm but now it has begun to break up, spreading out into the jungle. After a brief rest, the group was ready to look into the lodge again. Inside they found a great deal of salvage from a Chelish ship called the Infernus: the former captain’s bed, a fine spice cabinet with waxed bags of pepper, suits of quality clothing, logs and charts, and so on. As Killian cataloged the lodge’s contents and Valana tapped the floor looking for secret compartments, Shiera examined the hanging corpse. As she drew near to do so…it grabbed at her! The man wasn’t dead after all, or so it seemed. Fortunately it missed and the others quickly surrounded it and put it to rest…again. The final survivor of the Infernus was the ship’s former carpenter, Aaron Ivy…so they gathered from the scrawled notes they found in the margins of the ship’s logs and on the back of sea charts. There were originally several survivors of the storm that badly damaged their ship but the wreck had also torn open a cage containing the ship’s ghouls (MA: Yeah. What’s Golarion’s version of “WTF? !”) and several crewmen were infected by their bites. As the infection spread and more crewmembers died and rose again as ghouls. 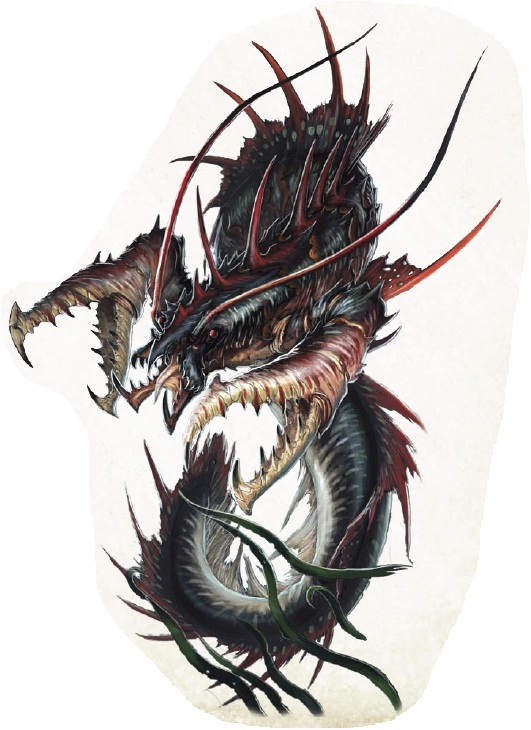 He managed to kill all but the three former ship’s whores…his locket containing a likeness of one of the three may explain his inability to finish off those particular creatures. Ivy took refuge atop the ridge and built his stockade and lodge. He also cleared the jungle and planted the crops, though it was difficult to maintain these while dodging the former whores and the swarms of ghoul-fever-infected mosquitoes and bot flies. One day, several years ago, he was returning from the field and encountered his former love. She bit him and, though he escaped to his lodge, he soon took ill. Rather than die of the illness and rise as a ghoul, Ivy decided to take his own life by hanging. With nothing much left to see, the group headed back to the field and gathered some corn and grains in sacks. Then they returned to the coconut palm beach for some coconuts and fresh crab, including three particularly large specimens. Finally, they headed back to the north shore and their gig, passing back through the swamp on their way. At the gig, they loaded their finds and looked to the Man’s Promise to see how things were on the ship. The group flashed acknowledgement and then discussed what to do. They decided to stay the night on the island and rest up before returning to the ship and a confrontation with Scourge and Plugg. The night passed without event and they took up the gig at first light and headed back to Promise. The crew all took a break to greet them and unload the cargo. After it was done, Plugg faced the returning group, with Scourge grinning evilly at his side, and the massive Owlbear behind, club in hand. And that’s where we left it. Other GMs and players of this AP will notice that our Plugg isn’t as bad as written. Scourge is every bit the scurvy jerk Richard Pett intended him to be but I didn’t take Plugg there. The PCs have actively attempted to do a good job on the ship and have worked hard to impress Plugg. He sees that, and doesn’t hate them, but he has Scourge in his ear and *does* see that they’ve built up a following aboard that’s more loyal to them than to him. That’s a situation that just can’t stand. 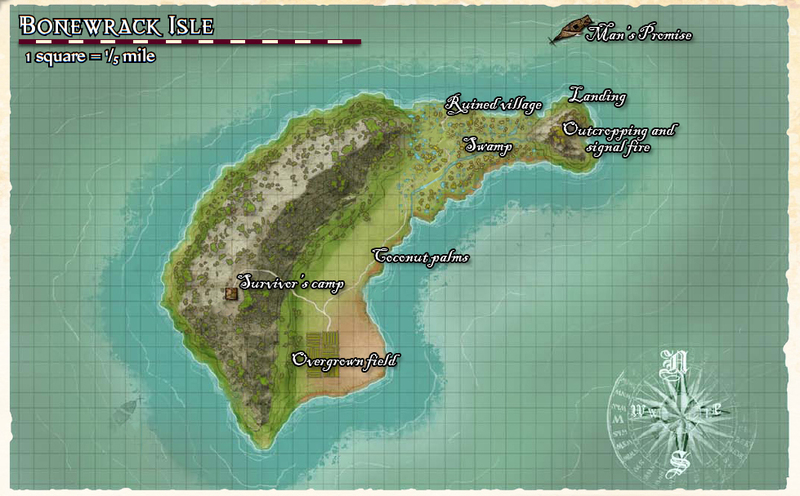 This Sunday in Skull & Shackles the PCs got down to exploring the island, looking for provisions for the Man’s Promise. Last session they had climbed a small outcropping of rock and spied some areas of interest. The group talked it over and decided the best course of action would be to take the gig west along the coast to the ruined fishing village and then follow the path from there through the swamp to the large tent they had seen in the southwestern part of the swamp. From there they could venture further south toward the coconut palm grove and the overgrown crop field. They pulled the gig ashore near the village and hid it well, in case any shipwreck survivors on the island might want it for themselves, then explored the ruins. The buildings of the village were all raised on stilts; prudent engineering, considering the entire area would probably be swamped at high tide. Most were barely standing and it was clear that the village had been abandoned for some time, likely decades. The tides had washed away any tracks that might have shown signs of recent activity and there was little clue as to what sort of people these may have been so the group headed south into the swamp, picking up traces of an old path that would allow them to avoid the worst of the swamp’s bogs and quicksand. Not far from the village they reached a particularly boggy area that had, long ago, been made crossable by a small wooden bridge. The bridge had decayed to nearly nothing, however, leaving only a path of wooden pilings jutting from the muck. Wading or swimming across would be difficult at best and climbing the thin branches that arced above the area would be nearly impossible without extreme skill. Valana sized up the situation and decided that she could probably cross by jumping from piling to piling. They tied off a rope on a sturdy tree and she took the other end to tie on a tree across the bog, creating a makeshift bridge the others could shimmy across. Valana accomplished her task with little effort, landing on the other side with a fancy display of acrobatics. She tied off the rope and the others began to cross. Unknown to the group, two rather large frogs had been submerged in the mire, watching the newcomers with interest. The hungry amphibians waited until Afari was almost to the other side and then struck, one lashed out with his long tongue and grabbed Afari’s hand, trying to pull him from the rope bridge. The other went for Keeya but missed his target and then tried for Killian. Afari and Shiera struck at the frogs with magical bolts while the others juggled bows while hanging from the rope. The scuffle went on for a few seconds until Keeya remembered herself and sang the frogs to sleep. They sank back into the bog and our friends finished crossing safely. They followed the treacherous path for a while longer until Keeya began to pick up on the excitement of her pet raven, which had been flying over their heads to keep a lookout for trouble. They proceeded cautiously from that point and soon began to detect what had enticed the bird: the smell of decaying flesh. They stopped and Valana again took the lead, creeping stealthily up the path. Above the trees, she caught sight of the huge tent they had spied from the outcropping and caught a whiff of cheap perfume coming from that direction. She edged on carefully until she could see the tent in full. The path showed signs of much coming and going; bare human footprints and, oddly, what appeared to be the tracks of a woman’s high-heeled slipper. The area was littered with decomposing humanoid body parts. The tent itself bore roughly drawn caricatures of human faces in garish makeup. She headed back to the group to report and they decided to try to sneak past the gory spectacle; as leaving the path and crossing the wild swamp itself would likely prove more dangerous than whatever might be living there. They were none too stealthy in their approach, however, and the tent’s denizens were ready for them, having heard the group bumbling down the path and taken up ambush positions. As they approached the tent, a scantily dressed slattern emerged from it and charged Valana (MA: See picture. 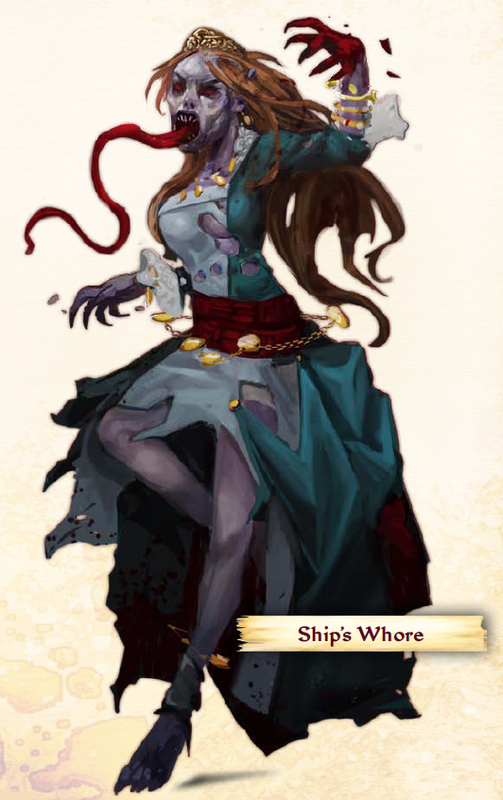 Paizo artists, in the future please refrain from including undead underboob in your works. It’s just…disturbing.) She shouted to her hidden companions, “More customers! Grab them, my beauties!” whereupon two more of the ghoulish creatures emerged from the brush and made for Keeya. Both Valana and Keeya were rooted to the spot (MA: my favorite…not…phrase from the old Commodore 64 game Telengard. The ghouls were killer in that game too.) Killian rushed in to help, tripped the harlot that was mauling Keeya, only to be bitten on the ankle in return. He too stood frozen in fear. As the creatures continued to gnaw and claw the petrified trio, Shiera and Afari pondered how to help. Shiera channeled the healing power of Besmara, causing the ghouls some discomfort, while Afari decided the best course of action would be to keep the monsters where they stood by making the ground around them slick with grease. (MA: This was a good move. I was worried about a TPK at this point because Shiera was only dealing a couple of points a round via channel and Afari’s acid splash damage was, on average, similar. Grease made the ghouls reconsider attacking the others, instead deciding they would just finish the meals they had on hand and deal with the rest later.) In fear for her friends, Shiera finally summoned the full fury of Besmara and sent the vile undead things to their final rest. Shiera saw to her friends’ wounds, patching them up as best she could, though there was little she could do about the possibility they may have contracted some disease from the foul things. Then they explored the tent, a nasty place filled with decaying body parts and the rags of revealing clothing. In it they found a ship’s chest bearing a bronze plate inscribed with the name Infernus, which Killian thought might have belonged to a Chelish vessel. Given the nature of the clothing and accessories in the tent, it seemed likely that the creatures they had just fought had been Infernus’ ship’s whores who had somehow contracted ghoul fever. They recovered the few treasures that could be discovered in the whores’ boudoir and left the swamp. Back on firmer ground, the group followed the path south as it neared a beautiful white sand beach and the coconut palm beach they had seen from the outcropping. The trees were full of ripe coconuts and many had fallen to the ground. They noticed shattered coconuts at the base of a few of the trees and then saw that those trees each held a rather large coconut crab. The group decided to bring the gig around later to collect some coconuts, leaving the crabs alone for now. They continued along the path to the south, nearing the overgrown field. When they reached a fork in the road they decided to leave the field, too, for later and instead head up to the ridge and the survivor encampment they had seen there. Along the rough, steeply rising path they found grisly totems: severed ghoul heads mounted on sticks, flies and other vermin infesting the rotting flesh. These were placed by the unknown survivor, the group surmised, to warn away the ghouls. At the top of the ridge they found a well-constructed stockade surrounding a large tree, draped with the remains of a sail, and a small lodge. The gate to the stockade was open and they entered cautiously. Inside they found a fresh-water spring and noticed a spyglass affixed to the south wall of the stockade. Killian, who had recently been speculating about why spyglasses were so expensive, went over to examine it. Looking through he saw that it was fixed and focused on a cove on the southwestern shore of the island…and that two grindylows were happily splashing in the surf there. Even better, they were wearing Sandara Quinn’s tricorn and Concho’s befeathered purple pimp hat! Meanwhile, Valana pushed open the door to the lodge and beheld a grisly sight: a hooded corpse dangling from a Chelish hangman’s collar, an overturned stool beneath his feet. By the smell of things, the man had been dead for quite some time. The awful stench had, in fact, attracted a huge swarm of insects…and these flew straight at Valana’s face as she opened the door! That’s where we left it on Sunday. We’ll find out what happens with Valana’s face-full of bugs and maybe something of the sad story of the last survivor of the Infernus next session. Stay tuned. We welcomed a potential new player to our group this Sunday; we’ll refer to him here as PL. We had a good time playing with him and hope that he’ll become a regular! PL’s character is Abula Afari, a Mwangi sorcerer (demonic bloodline) who was exiled from his tribe when he began to manifest magical abilities. He was, of late, a crewman onboard the Rahadoumian merchant vessel the Man’s Promise. 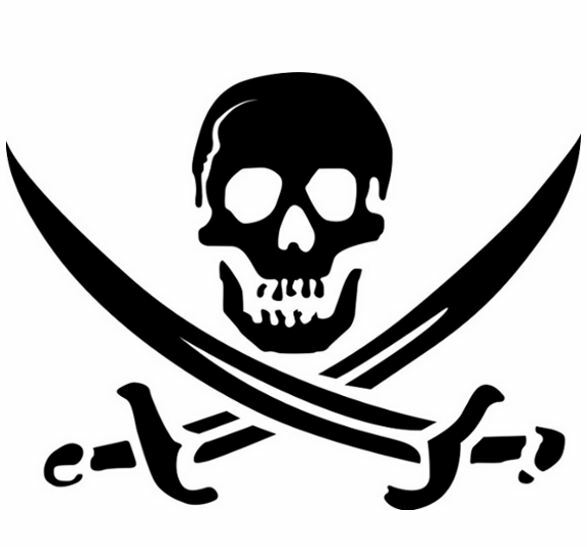 When the merchant was set upon and captured by the pirate ship Wormwood, Captain Barnabas Harrigan offered its crew the opportunity to join up or spend the rest of their lives at sea (at the bottom of it, actually). Afari decided the former proposal had the most merit. Mister Plugg was appointed acting captain of Harrigan’s latest acquisition and charged with sailing her to Port Peril for sale at auction. Master Scourge would serve as his first mate and choose a prize crew to man the vessel. He chose much of the original crew, including our old friends, and several of Promise’s sailors, including Afari. They gathered their gear, boarded the ship, and set sail for Port Peril. Once away, Plugg explained to the crew that the rules aboard the new ship were much the same as aboard Wormwood but that discipline would be a good deal stricter. All whipping offenses would now be administered by cat and there would henceforth be no evening’s rum ration or on-deck entertainment – in fact, anyone caught top-side after dusk would be in for lashes as punishment. Scourge and Plugg left our friends in their original roles: Shiera as cook’s mate (under Kroop, who had been exiled by Harrigan in favor of the better-smelling Rahadoumi cook from Promise), Keeya as rigger, and the rest as swabs. Afari was given a couple of tests and assigned to be a rigger. By the second day it had become apparent to some of the crew, Keeya especially, that Promise appeared to be headed due east, instead of north as would be the expected course to reach Port Peril. She delicately asked Plugg about it and he replied that the ship had changed course the previous evening to avoid a storm know to be northward. She accepted the explanation, though there was no sign of a storm in that direction. Later that night, Slippery Syl Lonegan (MA: Psycho Killer, qu’est-ce que c’est) informed our friends that she had been sneaking around the night before and noticed the officers, including Plugg’s toadies Kipper and Patch, had held some sort of secret meeting in Plugg’s quarters late that evening. She tried to listen at the door with no success but couldn’t make out what was going on inside (MA: she rolled a 1, cut her ear on the keyhole or something). The Promise maintained its course for the third and fourth days. By the end of that day it had run into the tail of another storm. Over the course of the evening and into the morning the storm grew in force and all hands were called to the deck to keep the ship afloat and on course. During the storm, as waves and wind stressed the Promise and visibility dropped to nearly nothing, the crew found themselves fighting boarders: grindylows from the briny deep! Our friends saw most of the action, and took some fierce wounds (MA: Killian nearly died!) fighting off the sea devils, before killing the creatures and sliding their bodies over the railing. After the battle, the crew realized that neither Sandara Quinn nor Conchobhar Shortstone – no one knew when they had been last seen, though Sandara’s holy symbol of Besmara was found on the deck. As the storm abated and the crew came to terms with what had just happened, sharp-eyed Keeya noticed a rock protruding from the water off the port side. Too late to shout a warning, Promise collided with an underwater reef and lurched to a hard stop. Examination showed the hull had been breached starboard, just at the waterline, and the ship was taking on water fast. Additionally, the ship’s barrel had been breached, spilling most of their fresh water, and seawater had ruined much of their provisions. Plugg ordered the bilges manned and repair crews began ripping up the deck to patch the rent hull. As dawn broke the crew saw that they had come to rest just a little over a quarter-league from a small island, due south of their position. Plugg ordered our companions, Afari, and one or two others to take the ship’s gig to the island to replenish the Promise’s supply of fresh water and food. Before they left Slippery Syl took Valana aside and told her that the group should watch their backs, as she believed the senior officers were plotting something. Valana made her promise to keep them informed using a mirror and code and then the group set off for the island. The island appeared to be crescent shaped, dominated by a small jungle-covered ridge along its western shore. The north-eastern tip featured a short outcropping of rock, with what appeared to be an unlit signal fire at its peak. Between the ridge and the outcropping was a swampy area, probably salt marsh, and the ruins of a small fishing village. The crew landed the gig on the island’s northernmost point and made their way to the outcropping. Valana and Afari made their way to the top and had a look around the island. From its peak they could see a tent of some kind in the swamp to the west, a field of crops in a jungle clearing, now overgrown and gone wild, and a survivor’s encampment on the southern tip of the ridge. On the eastern shore was a rich-looking grove of coconuts, potentially a good source from which to replenish the Promise’s larders. They climbed back down and the crew plotted their next move. That’s where we left it on Sunday but we’ll take it back up again next week. NB: I’m *way* behind on recapping these S&S sessions…but hoping to catch up soon. I’ll post them here as I get them completed, back-dated to when the sessions happened. 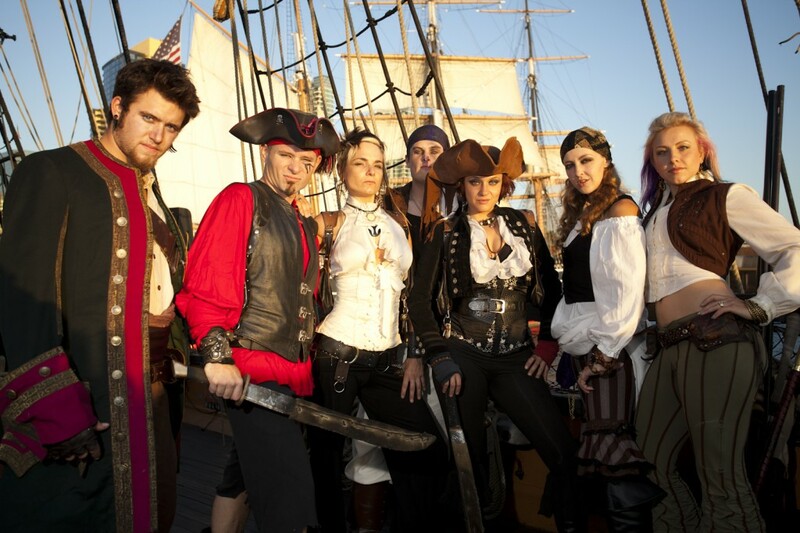 The short of it is: the PCs tried to make nice with most of the crew to win friends, fought with Aretta Bansion and her cronies, explored the ship, did some boarding training, and, finally, engaged in a boarding action to win the Man’s Promise. Of course there were lots of nice little role-playing tidbits in there too…which is why I want to post a little more detailed account!